Do you see the old lady or the young woman? A lot of people can only see one or the other. There is no way to see both. I can see one or the other, but I have to switch my perspective: the young woman is looking back, and the old hag is looking to the left of the viewer. It is impossible to see both at the same time because our minds can resonate at only one viewpoint and not both. The new BBL is very much like this optical illusion. I can understand why neo-liberals would see only the young lady in the new BBL. I don’t think the old hag is even visible to them. What’s worse is that the new BBL has even painted the cheek of the young lady with rosy colors, to make the young lady look even more attractive. In fact, I can see that the old hag has gotten worse. The politicians are starting to praise the new BBL. They claim it will finally bring peace in Sulu and Mindanao. I doubt it very much. Last time around, we were lucky the Supreme Court rejected the old BBL. The politicians were already about to celebrate the enactment, but the Supreme Court rejected it at the last minute. What is wrong with the new BBL? I urge Pinoys not to focus on the rosy cheeks of the young lady. Article IX is where the neo-liberals would focus, and indeed, it sounds much better than the old BBL. “Full respect for human rights” has even been added in Section 6. The judicial authority shall be vested in the Bangsamoro Shari’ah judiciary, in accordance with the power of the Supreme Court, particularly on the Bangsamoro Shari’ah High Court, Shari’ah District and Circuit courts, and other subordinate courts which Congress of the Philippines may create upon the recommendation of the Bangsamoro Shari’ah High Court through the Supreme Court. This notwithstanding, Congress, upon the recommendation of the Supreme Court, may likewise create Shari’ah courts outside of the territorial jurisdiction of the Bangsamoro government in areas where a considerable number of Muslims reside. The Supreme Court shall station these courts. Shari’ah (Islamic Law) which is the law forming part of the Islamic tradition derived from religious precepts of Islam, particularly the Qur’an and Hadith, shall be distinctively applied as the underlying basis of the Bangsamoro Shari’ah judicial system exclusively over Muslims or persons who voluntarily submit to the Shari’ah Court. Section 2 would expand the jurisdiction of Shariah courts OUTSIDE of the current Bangsamoro territory. This is unacceptable. Section 3 would make Shariah take precedence over the Philippine constitution, at least for Muslims “or persons who voluntarily submit to the Shari’ah Court”, for ALL legal matters, including criminal cases. Why did this pass the scrutiny of our politicians? Perhaps not one of them understand what Shariah jurisprudence is. The old hag is invisible to them. Let’s take a simple case to illustrate how Article X would invalidate the Philippine Constitution in the Bangsamoro (and eventually for all Muslims, wherever in the Philippines they may live, as per Section 2). Maria is a good Catholic. She is friends with Myrna, who is Muslim. Maria and Myrna have invested a lot of good deeds to each other: Maria helped Myrna when Myrna was in trouble with her family. She let Myrna into her home at one time when Myrna needed a place to stay for a week. Myrna in turn has lent money to Maria when she needed it badly. The two women are very good friends, and they see each other almost everyday. To make the story short: through Maria, Myrna got exposed to Christianity and was attracted to it. Eventually, Myrna decided to convert to Christianity. She told Maria about it, but nobody else knew at first. Then the bombshell came in: Myrna’s family found out. First of all, does any politician in Imperial Manila even understand that converting outside of Islam is a crime in Shariah? Can freedom of religion (which is a recognized human right, last time I looked) be really allowed in Shariah? There will be a court case against Maria and Myrna, and of course it can only be heard in a Shariah court. What happens to Maria’s human rights (not to mention Myrna’s)? Can this case be elevated to the Supreme Court, when it is clear under Sections 2 and 3 of Article X of the BBL that only a Shariah court has jurisdiction? Let’s not rely on the Supreme Court to reject the BBL (again) this time around. I do not believe the Supremes will even have the courage to reject the BBL twice. Let us instead reject Sections 2 and 3 of Article X, and go back to the old BBL at least on this matter. It is very important, not just for the sake of Christians in the Bangsamoro territory, but also for the sake of our Muslim brothers and sisters. If it is politically impossible to reject Shariah in whole, then we should at least settle for something less drastic, by explicitly stating in Article X that the Philippine constitution supersedes Shariah, and that Shariah only applies to non-criminal cases. Conversion should be allowed both ways: Christians can convert to Islam, and Muslims can convert to Christianity. A Muslim territory without Shariah is not uncommon. In fact, most Muslim countries around the world do not use Shariah in their courts. Filipino Muslims should be subject to only one constitution, the Philippine constitution. Federalism does not mean the absence of a unifying constitution that at least defends the rights of citizens. Power is devolved to the different regions, but core principles in the constitution should apply to all regions. No region, although very much independent, can establish its own constitution that contradicts the federal constitution. Therefore, Shariah cannot be applied in the Bangsamoro if we are to remain intact as a federal country. At parties, I often end up talking politics with my friends. (Ideologically my politics is nearest to Libertarians, but I have consistently voted Republican.) On the one hand, I am glad that, even without Trump (and at times, especially if we ignore Trump), the contrast between Democrats and Republicans cannot be as clear now as it has ever been in the past. On the other hand, even though there is indeed an ideological war in America, that war is being fought in op-eds and blog posts like this one, and also in dinner conversations all over the land. This war of words can sometimes escalate into fist fights, but never with bullets and bombs. I am happy to fight in this war. Words are cheap, and honest minds can be convinced. The US Constitution guarantees freedom of speech, and whether it is in this blog or in conversations at parties, I am confident that bullets won’t be flying because of anything I’ve said or written. We fight this war on the intellectual plane, not by the count and power of arms. I could lose a battle by lacking facts to bolster my position in some intellectual issue, but I expect to be alive the following day. In contrast, let’s imagine how this kind of situation could play in a Sharia system. First, let’s admit it: there is no freedom of speech in Sharia. I have a friend who has traveled to the Middle East and made friends with Muslims there. (I don’t remember which particular country, and I don’t think it’s important in this story.) He met and made friends with a family whose members consist of two beautiful sisters and several brothers. On the surface, the two sisters were devout Muslims, but did not wear headscarves whenever they were allowed not to. It was only after befriending one of the sisters that my friend came to know that she was not really a Muslim anymore, and that she studied the Bible on her own. She kept that Bible in a place where only she knew; and to be able to read it, she had to change its cover to look like it’s a sacred copy of the Koran. My friend discovered much later that the other sister was also a convert. He was told by both not to tell anybody, so it took him still another while to finally decide to let each sister know. It was a big relief for both of them, and now that they knew, each had become a tremendous source of invaluable support to the other. However, the tears of joy they had shed could still become tears of sorrow if and when either one of them were exposed. They vowed never to expose one another, if either one of them were caught. Islamic Ideology does not recognize the value of free speech; it follows that the only way it can spread itself is by violent coercion. Once you see this, then you are on the side of Republicans in the issue of how to fight radical Muslims. I suppose Islam as an ideology worked and dominated the known world thousands of years ago, because information was easier to suppress then. Now, with the Internet and smart phones, it is not so easy. Any Muslim with a modicum of intelligence can discover data that contradicted Islam. I am not saying that it is easy to defeat Islamic ideology. I understand that it would take several generations to know which side would have won. The story about the two sisters illustrate how difficult it is to defeat Islamist radicals. By being secret converts, the two sisters risk not only their positions as family members, they are also risking their lives. They cannot possibly communicate with other people of the same mind, without further risking their lives. The best that one can hope for is that Muslims with above average intelligence can continue to be curious and questioning. I am also not saying that radical Muslims are all stupid. To be sure, there are brilliant strategists among their leaders. They can still win, but only if we (on the this side of the ideological divide) allow it. This is where the raging intellectual war between Democrats and Republicans is crucial. The result of this non-violent war will be revealed in ballot boxes this November; and that result could determine whether we allow the Muslim radicals to win or not. Arab self-doubt: the thinking Arab, observing the world around him, is starting to see the writing on the wall. Let’s first clarify what is religion. Religion should be personal. It is a set of personal beliefs about why we are here in this world, where we are going, and how we should behave with respect to this philosophical foundation. It is a worldview that guides our everyday decisions and actions on a personal level. Religion can also mean the congregation of a group of people (“organized religion”). In the past, even within Western Civilization, religions have been used to justify rule by hereditary succession. Most governments have progressed beyond this kind of rule. The world has mostly become democratic. Even in Sharia (Muslim Law) countries, democracies have sprouted and grown. Nowadays, the only remaining religious monarchy is Saudi Arabia. However, in many countries even today, government rule is still justified and founded on religious grounds. I include communist countries in this list. Is communism a religion? As defined above, religion is a set of beliefs. One characteristic of a belief is that by definition it is faith-based: you continue to believe in it even though it has been amply proven otherwise. Communism is violently anti-religion, but it has religious characteristics itself. Case in point: China. China has clearly gone capitalist, but its communist leaders still deny this. The Chinese communist leaders have proven, by their own actions, that communism just won’t work, but they can’t admit it. They cannot admit the failure of communism most especially to their own people. This kind of behavior is no different from that of religious leaders when faced with scientifically-proven facts about the fallacies in their beliefs. Faced with the problem of a popular but blasphemous book, religious leaders ban the book or at least prohibit the faithful from reading it. Likewise, faced with the popularity of playing in the stock market, communist party leaders in China have admonished the faithful (communist party members) from engaging in stock trading. Why even be a communist party member when you know that your core beliefs have been blown to smithereens? Because there are practical and immediate benefits to being a communist party member. Party members are first-class citizens, everyone else is second-class, a phenomenon in China which parallels a similar observation in countries like Saudi Arabia. In the Kingdom of Saud, there are clear advantages to being Muslim, especially about getting the best jobs and best positions within a job category. This explains why it is not uncommon for Filipinos who have worked in Saudi Arabia for several years to convert to Islam. If you agree that communism is just another religion, it shouldn’t be difficult for you to understand that Islam is an ideology, at least partly. What makes Islam an ideology is that, just like communism, it includes a belief in an inevitable historical destiny for the world. Communists believe that the natural state of the world is communist, just as Muslims believe that our final destiny is Islamic. Islam (just as communism), therefore includes a “master plan” for how humanity can reach the final state. Never mind that the historical path to the final state of utopia is forced on people violently: for both communism and Islam, the end justifies the means. The objective is not justice in the here and now, but rather the objective is that one final state of society. Communists believe that the inherent contradictions in capitalism eventually lead to the emergence of communism. Muslims believe that religions other than Islam eventually lead to the one true religion. For Muslims, we are all Muslims inside us; it’s just that we either don’t recognize it or we refuse to see the essential truth. We have been led astray by minor religions. We just need a little push to lead us to the one true religion that lies dormant within us. That “little push” could be violent, but what difference does it make to kill a few hundred or even a few thousand non-combatant people against the good of all humanity? In fact, most Muslim communities honor as martyrs those who die killing people of other faiths. If Muslims themselves are not going to protest against the radicals, we non-Muslims should at least not acquiesce to Islamic ideology. The problem is the perversity of neo-liberal attitude and irrational views on religious diversity and racial discrimination. Liberals either don’t understand or their fear is clouding their understanding. If we don’t at least denounce what is clearly very bad behavior and point to its cause, we would be encouraging Islamic radicals and those who quietly believe in them. Religious freedom does not mean tolerating very bad behavior. It does not matter what religion you have, if your religion teaches you to kill innocent people, then there is something wrong with your religion. If you put that “religious” teaching into practice, justice requires that you and the Imam who taught you be put down or banished from civil society. Neo-liberals have been blaming all religions whenever an outburst of violence against civilians occurs, even in the face of statistical preponderance of Muslims committing those crimes. This indefensible liberal view is exemplified by Obama’s statement that “Lest we get on our high horse and think this is unique to some other place, remember that during the Crusades and the Inquisition, people committed terrible deeds in the name of Christ …” Never mind that the Crusades were a response to Muslim aggression and Christianity and its teachings are now way past the despicable phase that was the Inquisition. Never mind that Muslim ideology and nothing else (not “injustice” against Muslims, not the “lack of opportunity” for Muslims) is to blame for all jihad attacks. Real leaders point out an unmistakable lie when they see it. Political correctness, especially when practiced by no other than Obama himself, makes a mockery of the truth. Political correctness allows and even encourages the abdication of leadership. low energy required per kilometer travelled, per kilogram of transported mass. However, the HyperLoop as currently envisioned does not take advantage of another source of potential savings in energy: namely, by travelling non-stop. All else being equal, as much as 90% of energy can be saved per trip by not stopping, and this benefit is free, thanks to the law of conservation of kinetic energy. How can passengers get aboard and get off the HyperLoop modules that do not stop? Here is a scheme. Allow terminals along the reduced-air or vacuum tube track. The tube track itself is a closed loop in which a number of trains travel non-stop. Each terminal along this closed loop is designed to allow a car to be added and removed from the train, while the train is running at high-speed. In between terminals, passengers are free to move from one car to another, just as in normal (“ancient”) trains. This allows every passenger to start her trip from any terminal and end her trip at any terminal (including the one she started from). To end your trip, simply walk to the car that is to be ejected at the next terminal. Each terminal forms a much smaller loop in itself. This smaller loop is divided into segments, color coded in the diagram. The white segment at the bottom is where the insertion car starts and the ejection car stops. The yellow segment to the left is where the insertion car enters through an airtight door. As soon as this airtight door closes, air is pumped out from this chamber while inside the car normal barometric air pressure is maintained. When enough air has been pumped out and air pressure is low enough in the depressurization segment to match that in the main tube track, another airtight door is opened. (This door separates the yellow segment from the green acceleration segment.) 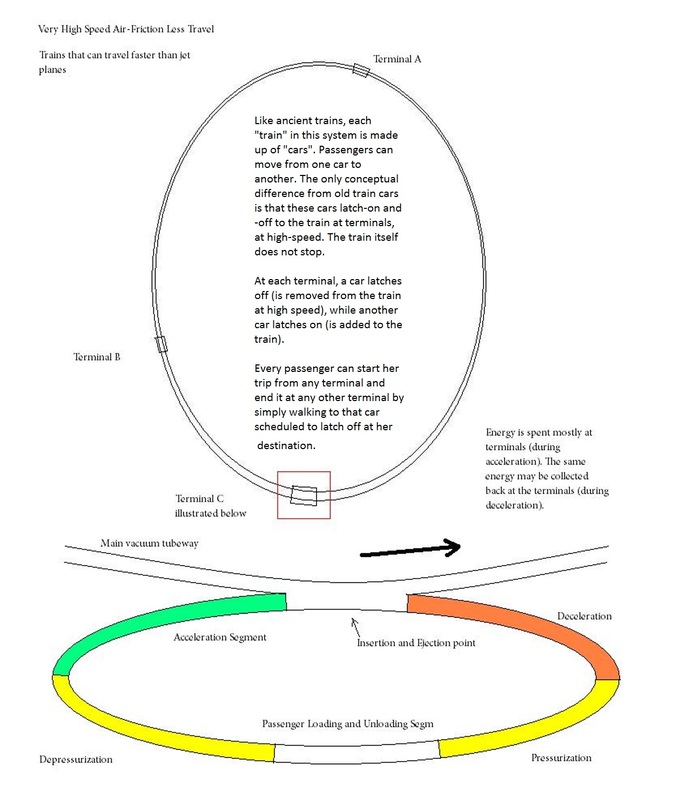 In the green segment, the insertion car accelerates until its speed equals the constant train speed. The whole sequence of passenger boarding, depressurization, and acceleration is timed such that, at the same time that the car enters the insertion/ejection segment, the train arrives and is running parallel to it. At the same time that the insertion car latches itself onto the train, another car forward it is removed from the train. This car slows down as it enters the orange deceleration segment. The yellow segment to the right is already depressurized by the time the ejection car enters it. An airtight door closes behind the car as it enters the yellow pressurization segment. As the car continues to decelerate, the yellow segment is filled with air. By the time it reaches the other airtight door ahead of it, pressure in the yellow segment will have equaled one atmosphere. Passengers can then get off in the passenger unloading segment. Would you believe I drew the above diagram in April, 2009? I have been thinking about air-friction-free transportation before Elon Musk first published the idea.